In what has become an annual tradition, Hollywood celebrated the birthday of their most famous rock and roll drummer, Ringo Starr, on July 7th. 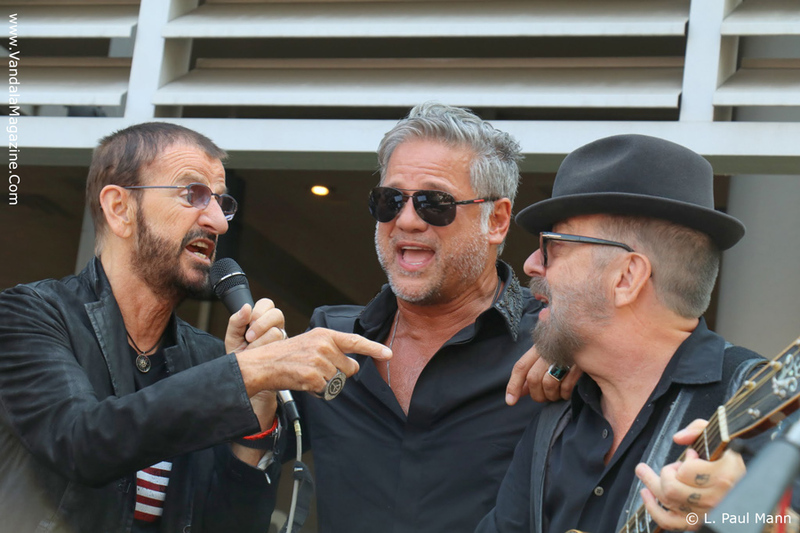 For the last several years Ringo has been joined by a group of some of Tinsel Town’s most elite artists and several hundred lucky music fans, in front of the iconic Capitol records building, right beside Ringo’s star on the infamous Hollywood “Walk of Fame”. 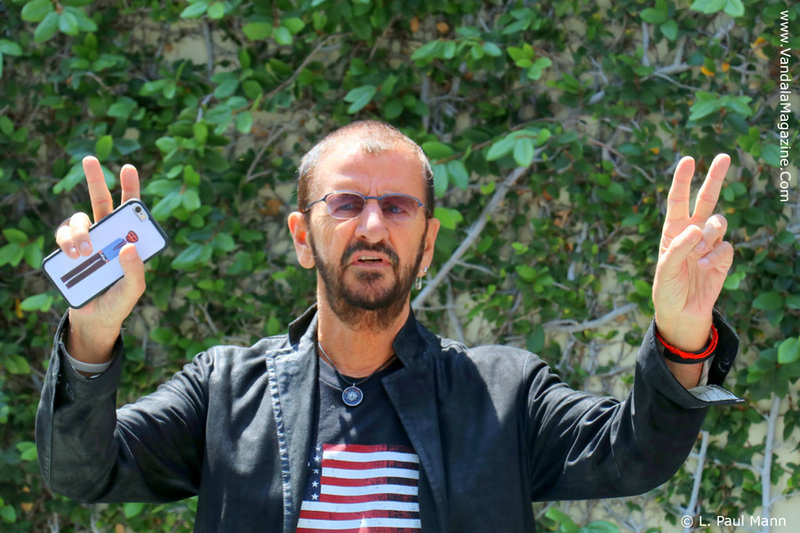 The event features an impromptu jam session and a live web link message of peace and love from the beloved former Beatle and his well known friends. The third and final set was led by English music master Dave Stewart of Eurythmics fame, who along with New Zealand singer Jon Stevens and a violinist, played “With A Little Help from My Friends” and “The No No Song,” with Ringo joining in at the end. Stevens wowed the crowd with his vocal prowess. The Maori descendent has had a long career in pop music dating back to the 1970’s and even toured for several years as the replacement lead singer in INXS, after the untimely death of Michael Hutchence. But his most recent project is performing with the Australian American super group of veteran rockers, The Dead Daises. His final duet with Ringo had the crowd singing and cheering in the mid day summer sun. The concerts were followed by a speech from Ringo inviting the crowd to send out a message of peace and love to those watching on the web, exactly at noon. But first Ringo invited his famous friends to share the stage including all the musicians that had played, as well as rocker Joe Walsh, filmmaker David Lynch, a fellow Transcendental Meditation enthusiast, actor Bud Cort of “Harold and Maude” fame, fellow British rocker Eric Burdon, keyboardist Benmont Tench from Tom Petty’s Heartbreakers, blues-rocker Edgar Winter, comedians Howie Mandel and Richard Lewis, Ringo’s wife Barbara Bach, Toto guitarist Steve Lukather, producer-songwriter Glen Ballard, veteran rock drummer Jim Keltner, Mr. Mister bassist-singer Richard Page and the All-Starr Band drummer Greg Bissonette. Walsh took the lead as cheerleader for the countdown to the universal peace message and then led a happy birthday sing along. 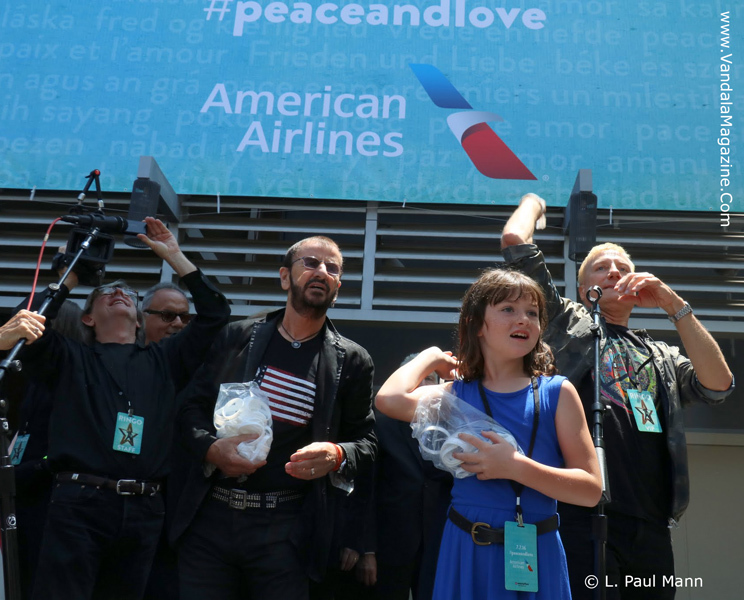 Meanwhile, Ringo and his friends passed out free bracelets and peace sign cookies to the Starr struck crowd. Finally, a birthday cake was wheeled out and Ringo blew out the candles as the gleeful ensemble of Hollywood legends looked on. 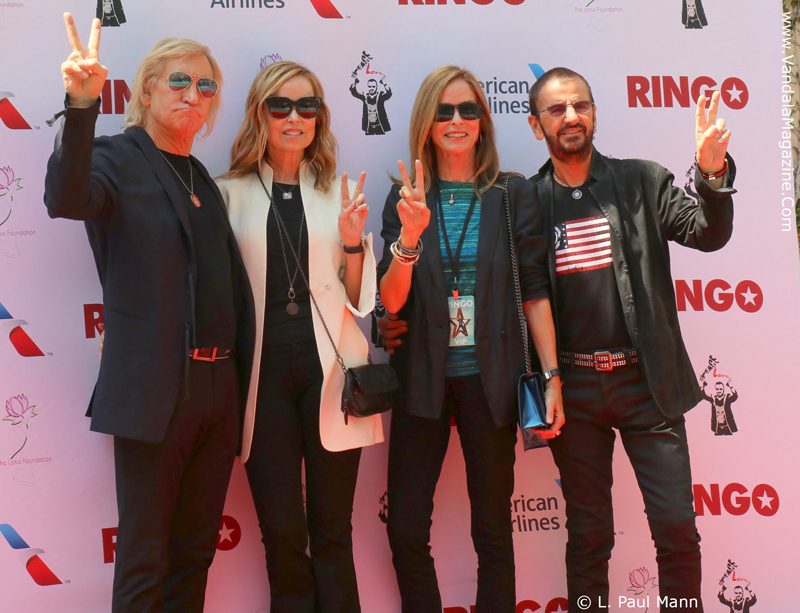 Ringo and his current band ,which includes Todd Rundgren, Richard Page of Mr. Mister, Gregg Rolie of Santana and Journey, and Warren Ham, just finished their spring and summer tour with a show at the Greek Theatre in Los Angeles on July 2nd. But shortly after the birthday party in Hollywood, the band announced they would be adding additional dates in the fall, including a stop in Orange County, California, on October. 20th, at the Segerstrom Center for the Arts in Costa Mesa.